Uma das principais preocupações de Mercé Izquierdo Aymerich é como estudantes percebem a Química na sala de aula do colégio. O currículo tradicional criado a partir de conteúdos e procedimentos, forjado como uma preliminar do que virá na universidade não funciona. "Acredito que esse currículo deve ser introduzido mais tarde, apenas quando o aluno optar por estudar Química. No nível escolar, é preciso conhecer as condições para a vida no planeta, os recursos naturais, o respeito à saúde, e mostrar como a Química contribui para a vida", declarou a professora Mercé ao Boletim da SBQ. "Os estudantes precisam entender como funciona o mundo em que vivem." 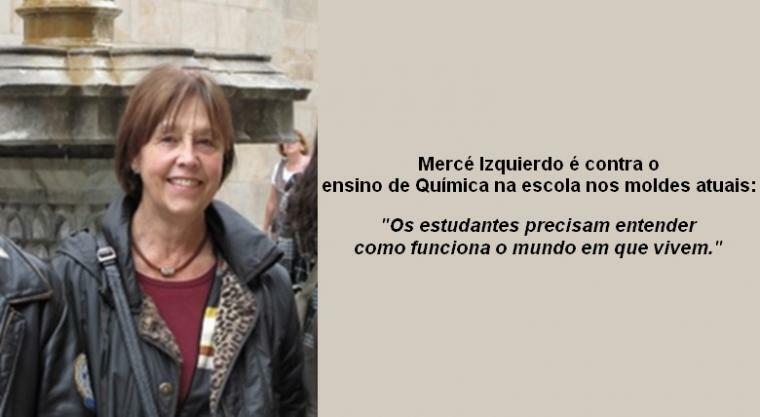 Professora do departamento de Ensino de Matemática e Ciências Experimentais da Universidade Autônoma de Barcelona, com doutorado em Química Inorgânica, Mercé confirmou sua vinda ao Brasil para falar sobre este tema na 39ª. Reunião Anual da SBQ, que será realizada de 30 de maio a 2 de junho, em Goiânia. Ela vem com a experiência de ter lecionado Química no ensino secundário e de ter contribuído para a formação de professores na Catalunha. How should science be taught in the school level? The usual way to design the curriculum for the teaching of science (chemistry) in elementary level is based on the conceptual and procedural contents of the discipline, inspired by what is taught at university level. For us, school chemistry must meet the following objectives: to know the conditions for the life of the species that live in our planet, a good management of resources and have care for their own (and other people) health; and to teach how/ why chemistry is important for this. It is needed another way to organize knowledge in basic education, which requires, first, identify the main contribution that chemical activity has made to Western culture and setting patterns of explanation and actions that structure all the teaching- learning sequences. Our goals are not 'disciplinary knowledge' in elementary school; this will come later, when students have explicitly opted to study Chemistry. In order to achieve this new concept of science education, what changes would be necessary in the formation of teachers? Teachers have to ask students open questions which must develop student chemical activity. Answers have to be constructed by pupils. All this is very difficult and for this teachers have to know history and philosophy of chemistry and other scientific disciplines, because the teaching has to be multidisciplinary. Why is it important that youth study sciences? Our scientific culture is a rich heritage that gives a special view (theoretical, with new languages) of our intervention (thanks to Chemistry) in phenomena. It is helpful and it must be taught because it is not possible to be reinvented. Which are the countries that have developed efficient educational systems, specifically for Chemistry? I think that teaching chemistry is now a challenge; Germany was in the head of teaching chemistry as a specialized knowledge in XIX century and now is also pioneer in teaching chemistry 'for all'. What do you expect from your visit to Brazil? “Epistemological Foundations of School Science”, M. Izquierdo, A. Adúriz, Science & Education 2003, 12, 27- 43. “Exploring the development of students' conceptual profiles of chemical change”, N.Solsona, M. Izquierdo, O. Jong , International Journal of Science Education 2003,25, 3 -12. “Un nuevo enfoque de la enseñanza de la química: contextualizar y modelizar”, M. Izquierdo, Journal of the Argentine Chemical Society 2004, 92, 115-136. “Hacia una teoría de los contenidos escolares”, M. Izquierdo, Enseñanza de las Ciencias 2005 23, 111-122. “Multimodal Science Teachers’ Discourse in Modelling the Water Cycle”, M. Izquierdo, C. Márquez, M. Espinet, Science Education 2006, 90, 202-226. A 39ª Reunião Anual da SBQ será no Centro de Convenções de Goiânia, de 30 de maio a 2 de junho de 2016. Curta a página da RASBQ e acompanhe as novidades do evento! Convide também seus amigos. Juntos, faremos uma grande reunião anual!